The rate for a First Class Mail Letter (1 oz.) for postage purchased at the Post Office is increasing by one cent to $0.50 from $0.49. If you print postage online (via Stamps.com), the Metered Mail rate will continue to receive a 3 cent discount off the Post Office price, with rates increasing to $0.47 in 2018 from $0.46 in 2017. Each additional ounce will cost an extra $0.21 (no change from 2017). The rate for a First Class Mail Flats/Large Envelope is increasing by two cents to $1.00 (1 oz.) and postcards are increasing by one cent to $0.35 in 2018. Overall, prices for Priority Mail Express will increase by 3.9%. A 1 lb. package going to Zone 8 using Priority Mail Express will cost $35.04 in 2018 compared to $33.76 currently. Priority Mail Express Flat Rate Envelopes will also see a rate increase in 2018. The increases vary depending on the type of envelope, ranging from $0.80 to $0.82 per envelope. Priority Mail will see an average increase of 6.2%. A 1 lb. package going to Zone 8 using Priority Mail will cost $7.76 in 2018 compared to $7.25 currently. Postage rates for Priority Mail Flat Rate Boxes as well as Flat Rate Envelopes will increase in 2018. The popular Priority Mail Flat Rate Padded Envelope will cost $7.10 in 2018 compared to $6.50 currently, a $0.60 increase. And the Priority Mail Medium Flat Rate Box will cost $12.85 in 2018 compared to $12.40 currently. Shipping rates for Priority Mail Regional Rate Boxes will be increasing for most Zones. However, Regional Rate Box A for Zone 5 will be saying the same price at $8.15. And Regional Rate Box B for Zone 5 will be decreasing by $0.30 to $10.65 from $10.95 currently. Overall rates for First Class Package Service will increase by 3.9%. 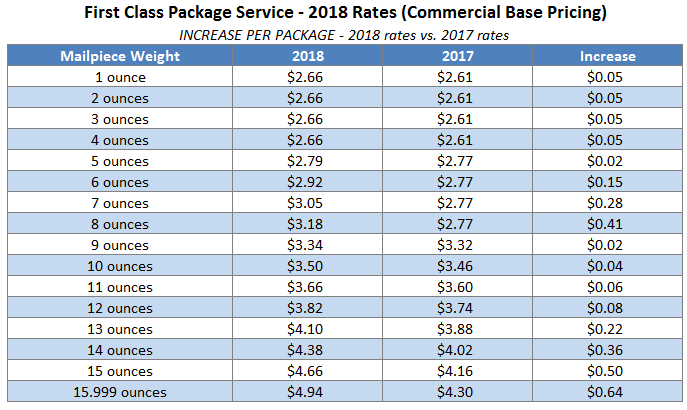 Rates are increasing the most in packages weighing 13 ounces or greater with a 15.999 ounce package costing $4.94 in 2018 from $4.30 currently ($0.64 increase). While most Parcel Select Ground options will be increasing, there are some weight and zone groupings where rates are decreasing. Parcel Select Ground rates are decreasing for Zone 4 – 4 lbs, and Zone 5 – 3, 4 and 5 lb. packages. Rates are also decreasing for Zone 3 for packages weighing between 44 lbs. and 59 lbs. Rates are seeing a much larger increase of between $1.03 and $4.11 per package in the 10 lbs. or heavier traveling to Zones 6, 7 or 8. Media Mail rates will increase by 1.9% in 2018. A 1 lb. package traveling to Zone 8 will cost $2.66 in 2018 compared to $2.63 currently. Global Express Guaranteed postage prices will increases across all weights and zones. Priority Mail Express International rates will be increasing by an average of 3.9% across all 17 Country Groups in 2018. Priority Mail International rates will be increasing by an average of 3.9% in 2018. First Class Package International Service rates will be increasing by an average of 3.9% across all 17 Country Groups in 2018. Once the rates are approved by the PRC, Stamps.com will automatically update all USPS rates inside the software and web-based version (Stamps.com Online) on Sunday, January 21, 2018. If you are a Stamps.com customer, no additional actions are needed and you will AUTOMATICALLY see the 2018 USPS rates in the platform.